This book is a brilliant tour de force of spiritual realisation. Brightly illuminating the deepest meanings of the text, and making it very clear what Krishna was saying when he first spoke the Gita to Arjuna, Prabhupada takes us by the hand and leads us to realms of unlimited bliss. The evidence speaks for itself. 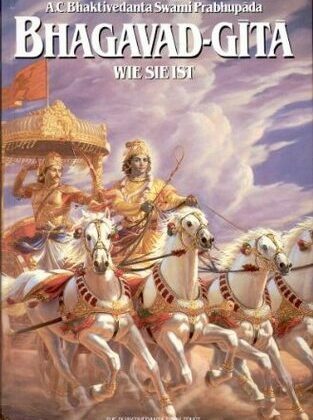 Prabhupada himself said that before he presented this translation and commentary there were over fifty English versions of the Gita available in the West, and not a single person had become God conscious as a result of reading them – which is the essential aim of the Gita. But when his book appeared it started a worldwide movement of people who dedicated their lives to God. That movement is still growing as thousands of people discover these wonderful teachings each year, transforming their lives into a dynamic spiritual quest for the absolute. Every day I study this book and am amazed by the ever deeper levels of transcendental knowledge it contains. It is my manual for sanity and happiness. Whenever things are difficult, a dip into the pages of Prabhupada’s Gita will throw everything into its proper perspective. If I were to be cast away on some desert island with just one book, this would be the one. It is a veritable treasure chest of knowledge, or, as the Vedas themselves say, a desire tree that can fulfil your every wish.